The destroyers Admiral Tributs and Vinogradov — classified as “large, anti-submarine ships” — docked in Manila early Monday, along with the Admiral Irkut, a “large sea tanker,” according to the Philippine News Agency. The most recent arrival comes just months before the two countries are due to sign a naval cooperation agreement, likely in July, which will reportedly involve more joint training exercises and reciprocal port visits. Monday’s Russia visit also comes amid the annual Balikatan joint exercises between the Philippines and US, which finish April 12. The Balikatan drills feature more than 7,500 troops, F-35B stealth fighters and include live-fire training and amphibious operations among other events. 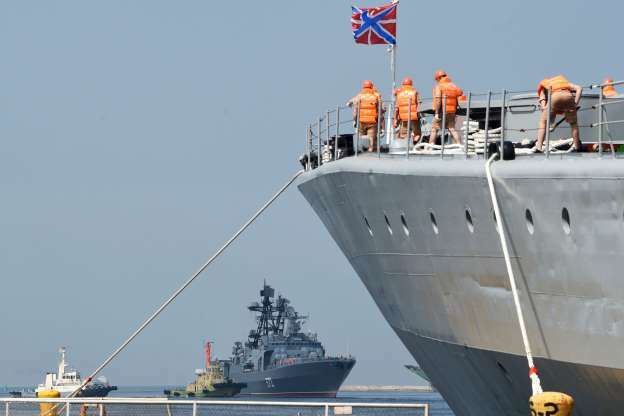 While the Russian ship visit is not to that scale, Moscow’s growing ties with the Philippines and presence in the region come at a time of increased tensions in the South China Sea. The Philippines government said hundreds of Chinese vessels, including some military ships, had been spotted around Thitu Island in the Spratly chain, which is controlled by Manila but claimed by Beijing. The Chinese flotilla began appearing around Thitu in December and January, about the time Manila began construction on the contested maritime feature. In a speech Thursday, Philippines President Rodrigo Duterte warned Beijing to leave Thitu Island alone, threatening military action in response to any Chinese aggression. China and the Philippines are just two of the many countries who lay claim to large portions of the South China Sea, along with Vietnam, Malaysia and Brunei. In a bid to reinforce their claim on the territory, China has built and militarized artificial islands across the important shipping lane. Tensions cooled after Duterte pursued a closer economic relationship with Beijing. Manila also turned to Moscow for support, with Duterte shifting his country’s previously close ties to Washington.